Go to… Go to… Home Vision One Realty Spotlighted Listings - Active Listings - Open Houses Search for Homes - Personalized Property Search - Map Search - Foreclosures - Commercial Search - North Fort Myers, FL - Fort Myers - Fort Myers Beach, FL - Cape Coral, FL - Mayo Florida - Waterfront Homes - Luxury Homes - Golf Course Homes - Sailboat Access Homes - Beach Access Homes - Admirality Yacht Club - Sabal Springs Homes - North Star Yacht Club Buyer/Seller Info - Mortgage Rates - Schools - Relocation - Weather Our Agents - About Us - Our Blog - Testimonials Contact Us - Dream Home Finder - FREE Market Analysis - Real Estate News!!! NEW CONSTRUCTION COMPLETED! 4 BEDROOMS, 3 FULL BATH HOME WITH MANY UPGRADES. 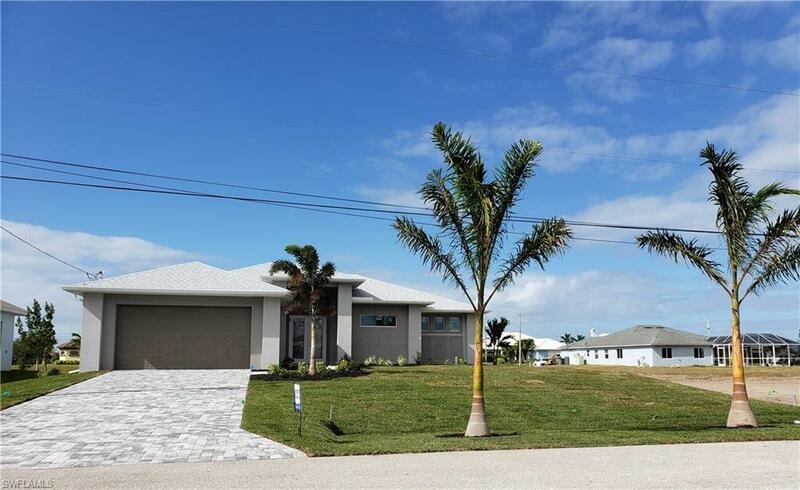 This home features 1825 sq ft and 3612 finished with 1143 sq ft Lanai and over sized pool-14x28. Open floor plan with large Raised Granite Island and Countertops in the Kitchen with Wood Cabinets, and Stainless Steel Appliances. Laundry room also features cabinets, sink with granite tops. Wood plank tile in family room, kitchen, laundry and baths. Master bath features tiled shower with seat. 3rd bath is a bonus leading out to the pool and provides extra guest suite. Other inside upgrades crown molding in family room and master with in direct lighting, 8ft doors, 5 1/4" baseboard with 3 1/4" Casings. Outside features Soffit lighting, Paver driveway and upgraded landscaping with 2-20 ft Royal Palm Trees creating great curb appeal. This home is close to new 7 Island development. No Assessments-well , septic and water softener system included. Vision One Realty Group, Inc. Copyright 2019 Multiple Listing Service of Greater Fort Myers and the Beach, Inc.; All rights reserved. The data relating to real estate for sale on this web site is the copyrighted and proprietary database of the Multiple Listing Service of Greater Fort Myers and the Beach, Inc. The properties displayed may not be all of the properties in the MLS\' database, or all of the properties listed with Brokers participating in the cooperative data exchange program. Properties listed by Brokers other than Vision One Realty Group are marked with BR logo and include the name of the listing Brokers. Information provided is thought to be reliable but is not guaranteed to be accurate; buyers are advised to verify facts before making the decision to purchase a property. No warranties, expressed or implied, are provided for the data herein, or for their use or interpretation by the user. Information provided is for consumer\'s personal, non-commercial use and may not be used for any purpose other than to identify prospective properties consumers may be interested in purchasing. This site will be monitored for \'scraping\' and any use of search facilities of data on the site other than by a consumer looking to purchase real estate, is prohibited. Listing broker has attempted to offer accurate data, but buyers are advised to confirm all items. Information last updated on 2019-04-21.